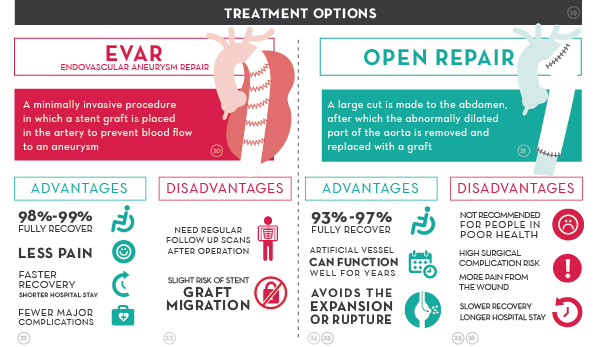 What do you need to know about Abdominal Aortic Aneurysm? Abdominal Aortic Aneurysm (AAA) is becoming more and more common in Hong Kong and is known as a “silent killer” due to its asymptomatic nature. The prevalence of this disease is global. U.S and U.K have seen 15,000 deaths  and 6,000 deaths  respectively caused by ruptured AAAs. In Hong Kong, more than 1,000 new cases of aortic aneurysm are reported every year. It’s important to increase public awareness and understanding around the disease. 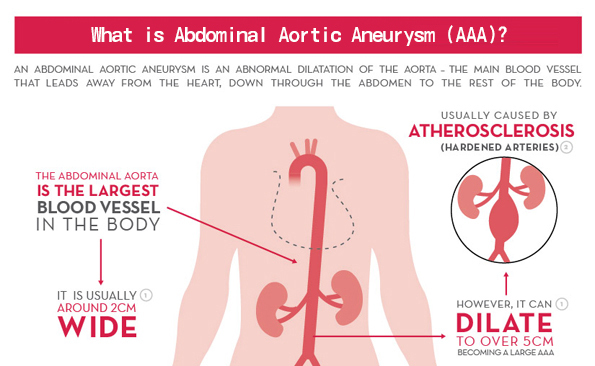 1: What is Abdominal Aortic Aneurysm (AAA)? 2: How common is AAA? 3: How dangerous is AAA? 4: What are the symptoms? 5: Who will have AAA? 6: How to diagnose AAA? 7: When & how to treat AAA? An abdominal aortic aneurysm is an abnormally dilated area in the lower part of the aorta within the abdomen  . The fact that it is asymptomatic means the aneurysm is often left unnoticed and unattended promptly. When the aorta becomes dilated, it behaves like blowing up a balloon. When the balloon is too excessively blown up, it will rupture. Usually when the size of aneurysm is >5cm, there is significant risk of rupture. Rupture AAA can cause massive bleeding within short period of time. 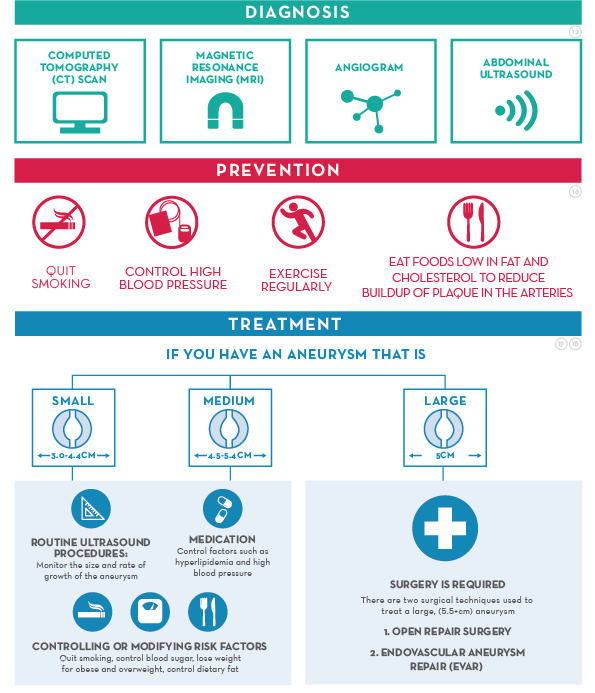 The overall mortality rate of a ruptured aneurysm can be as high as 100% and the risk of rupture increases as the size of the aneurysm expands. Once internal bleeding is caused by the rupture of aneurysm, it becomes a life-threatening condition. 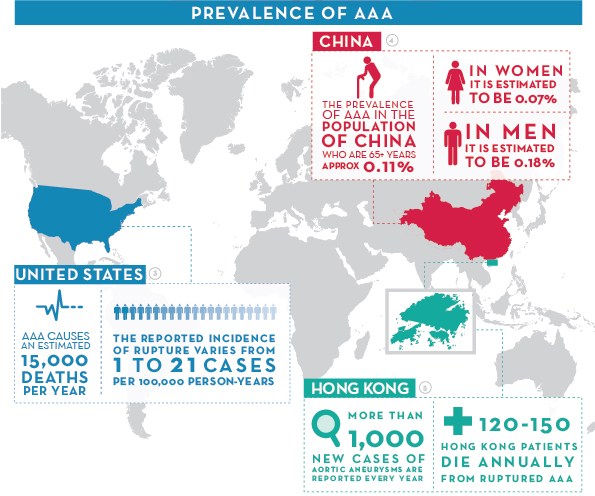 AAA is usually symptom free before it ruptures, which makes it difficult to detect at an early stage. Some patients may feel a pulsatile mass in their tummy. Any symptoms of abdominal or back pain in an AAA patient is suggestive of rupture aneurysm. Urgent medical assessment is necessary. 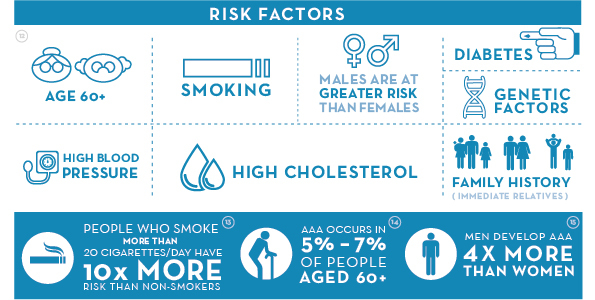 Smoking, aging, diabetes, high cholesterol and hypertension are the major risk factors of developing AAA and males are at greater risk than females. Despite the difficulty of detecting AAA at an early stage, a simple ultrasound scanning of the abdomen can already accurately diagnose AAA. Further detail imaging with CT scan, MRI, or angiogram are only necessary when surgical intervention of the AAA is necessary. 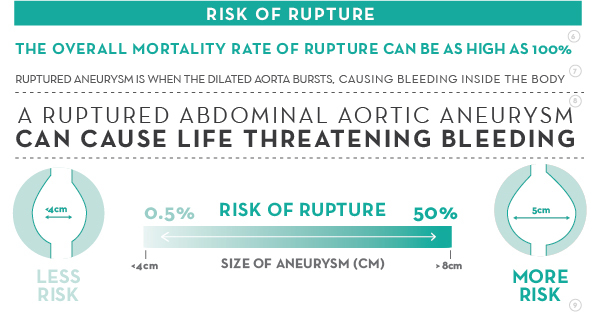 Although the mortality rate of a ruptured AAA is high, it is still preventable. Quitting smoking, controlling high blood pressure, regular exercise and a healthy diet will contribute to reducing the risks of developing AAA. When & how to treat AAA? Surgical intervention of the AAA is necessary when the size of the aneurysm is > 5cm in diameter. We want to fix the aneurysm before it ruptures. There are currently 2 treatment options for AAA. Endovascular Aneurysm Repair (EVAR) is a minimally invasive surgery involving only small wounds at the groins. It is associated with less pain, faster recovery, and is safer compared with open surgery. The traditional open repair of AAA involves large abdominal wound. Although it is more durable, it is more invasive and is currently reserved for cases with anatomy not suitable for EVAR.